Mike Ullery | Daily Call Skylar Sebastian, 1, of Piqua enjoys her first Thanksgiving dinner at El Sombrero in Troy as her mom Desiree watches. Mike Ullery | Daily Call Ruben Pelayo, owner of El Sombrero Mexican Restaurant in Troy, works in the kitchen of his restaurant on Thanksgiving Day. 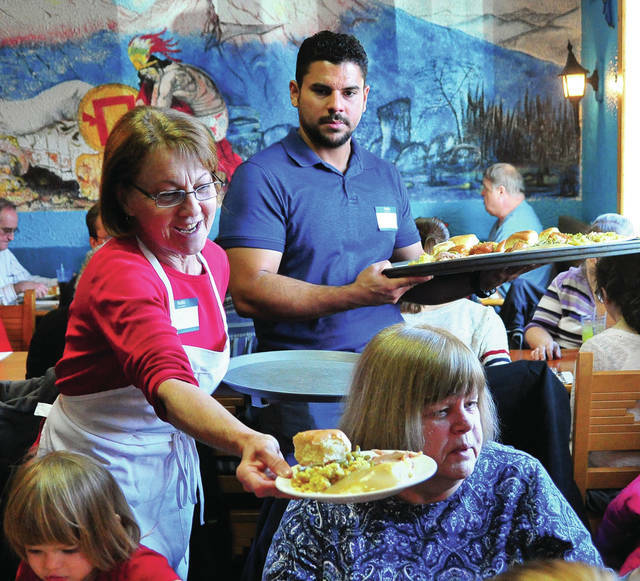 Mike Ullery | Daily Call Volunteers Kim Ojeda of Piqua and Rick Olivieri of Puerto Rico serve Thanksgiving dinner to a family at El Sombrero Mexican Restaurant in Troy on Thursday. 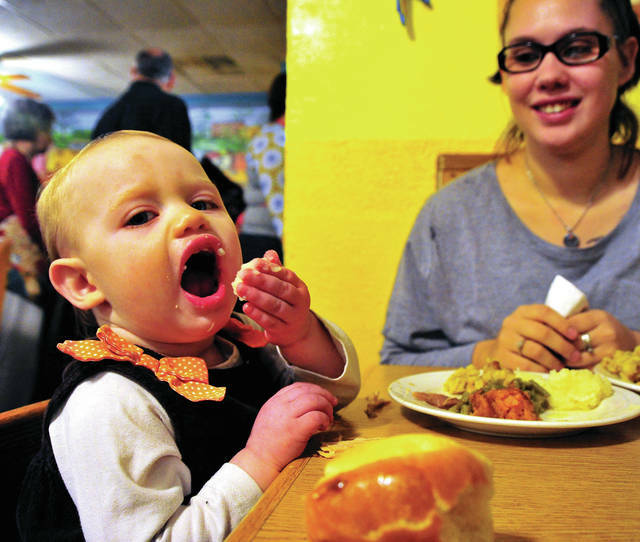 Skylar Sebastian, 1, of Piqua enjoys her first Thanksgiving dinner at El Sombrero in Troy as her mom Desiree watches. 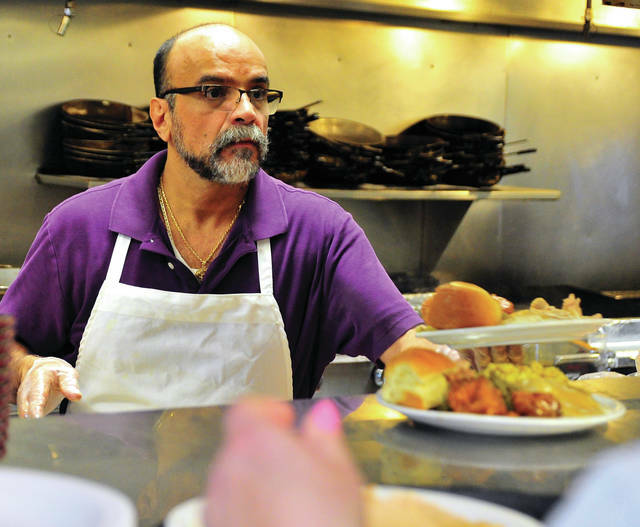 Ruben Pelayo, owner of El Sombrero Mexican Restaurant in Troy, works in the kitchen of his restaurant on Thanksgiving Day. Volunteers Kim Ojeda of Piqua and Rick Olivieri of Puerto Rico serve Thanksgiving dinner to a family at El Sombrero Mexican Restaurant in Troy on Thursday. https://www.dailycall.com/wp-content/uploads/sites/30/2018/11/web1_112218mju_thanksgiving_elsombrero1.jpgMike Ullery | Daily Call Skylar Sebastian, 1, of Piqua enjoys her first Thanksgiving dinner at El Sombrero in Troy as her mom Desiree watches. https://www.dailycall.com/wp-content/uploads/sites/30/2018/11/web1_112218mju_thanksgiving_elsombrero2.jpgMike Ullery | Daily Call Ruben Pelayo, owner of El Sombrero Mexican Restaurant in Troy, works in the kitchen of his restaurant on Thanksgiving Day. https://www.dailycall.com/wp-content/uploads/sites/30/2018/11/web1_112218mju_thanksgiving_elsombrero3.jpgMike Ullery | Daily Call Volunteers Kim Ojeda of Piqua and Rick Olivieri of Puerto Rico serve Thanksgiving dinner to a family at El Sombrero Mexican Restaurant in Troy on Thursday.